A nice evening at the dock. Oslo City Hall is behind the photographer. 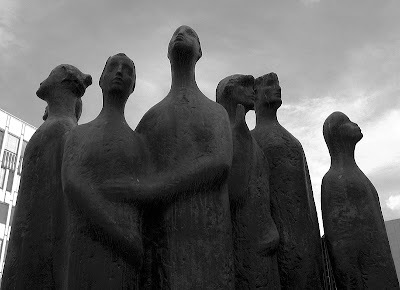 Heptakord - "The listening Seven"
"The artist Turid Eng's skulpture in front of the Concert Hall in Oslo is named "Heptakord" which means a scale of seven notes and is symbolized by the seven figures. They concentrate on listening and illustrate what the audience in the concert hall experience. 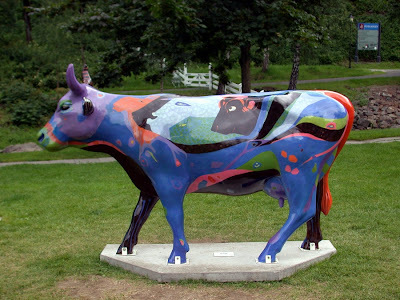 The sculpture is monumental in it form but sensitiv in its expression. The artist has created a miniature of the original Heptakord, a independant piece of art, not only a reduction in size. She has managed to give the miniature the same expression as the original sculpture." 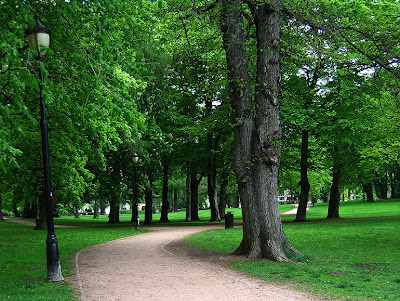 This is from the park "Vaterlandsparken" by the river "Akerselva" that runs through Oslo. This photo is from Norsk Folkemuseum, the museum I've showed you photos from earlier. First of all, I like how this woman looks like she's waiting for something or someone. I also like the walls behind her, the difference in building tecniques and colour. I especially love the warm, red brown colour. 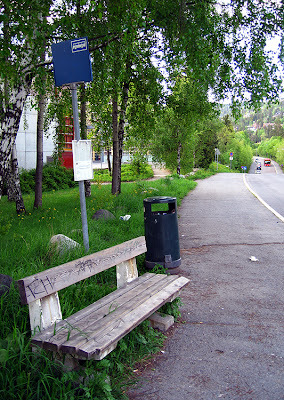 I know I'm supposed to submit photos only from Oslo, but I hope this can count as "a piece of Oslo". 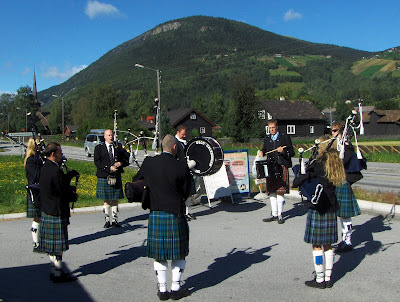 This is Oslo Caledonian Pipe Band, the band where I play. This weekend we were at Otta in Gudbrandsdalen, approximately 3,5 hours north of Oslo. Gudbrandsdalen is a beautiful valley! Many tourists go there to see the wonderful nature, and this weekend was really nice as the weather was lovely. In 1612 a force of some 550 Scots arrived in Gudbrandsdalen under the command of Colonel Alexander Ramsay with a company of Caithness men lead by Captain George Sinclair of Stirkoke. They were simply passing through the valley intent on reaching Sweden, which was then at war with Norway and Denmark over the territory of Kalmar in the south of Scandinavia. Their passage through Norway had been peaceful since their landing at the Isfjorden on the coast of Romsdal and Møre, and they could not have anticipated what awaited them at Kringen. They did not know that young men conscripted from the valley had been massacred in the Kalmar conflict, and that the farmers from Gudbrandsdalen were determined to resist them. Plans had been laid for an ambush, and the ambush was to be triggered by local girl, Guri, who was to watch the column as it made its slow passage along the old King’s road. To further distract the Scots from the ambush preparations, a man rode sitting backwards on his horse. Once the right moment arrived, Guri, watching from the mountain top above Otta blew a blast on her lur, a long wooden horn, traditional to the area. Tradition has it that the ambush started with logs and rocks crashing down on the Scots from the steep mountainside and blocking the road preventing advance or withdrawal, and tradition also has it that Captain Sinclair was felled with a silver bullet from a single musket shot fired by Berdon Sejelstad. 450 farmers fell on the Scots with their axes and scythes and fierce hand-to-hand conflict ensued that left the river running red with blood. It's a bloody story and not a very proud moment, as the farmers later executed most of the captured soldiers. And now, nearly 400 years later the event is remembered with concerts, art exhibitions, music and dance. It has been a tradition for the pipeband to take part, as to symbolise the Scots, I guess. The photo is taken at Kvam, one of the places we played. Today, my father, son and myself went for a walk. 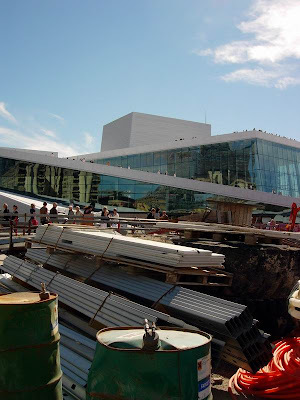 First, we took the boat from Vaterland to the Opera (Bjørvika) and it's special because it's underneath the roads and buildings, like a tunnel for the river (Akerselva). Then we went for walk at the Opera, which were only open today. (the news article is only in Norwegian). 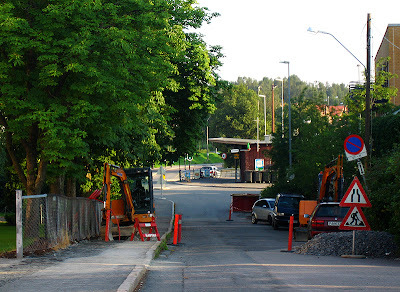 Afterwards we went to Sørvika where the tunnel across Oslofjorden will be built and went almost under the surface. 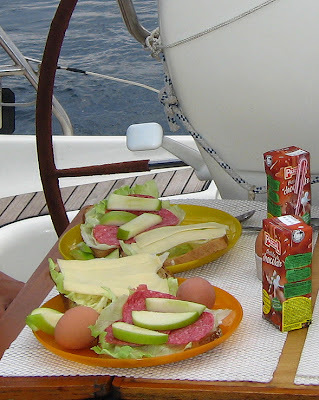 When we were done with that, we took the boat back to Vaterland. It was an awesome day! The picture shows how big the Opera really is, I thought it would be much smaller. 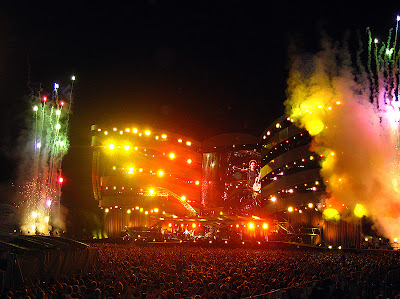 But when I saw all the people all around, I realised it is BIG! And it's still a building-site. It'll be finished in December, but will not open for public before April. This is taken behind the Monolith. A different view. There are stairs leading up to the Monolith, surrounded by many statues. Really interesting to look at. Sorry, that I totally forgot to put pictures up here yesterday! 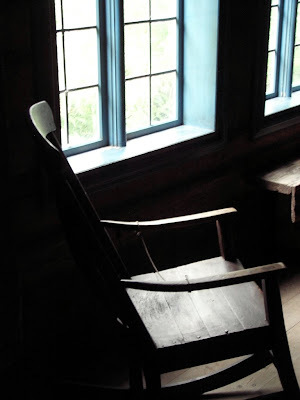 This is an old rocking chair from inside one of the old houses at Norsk Folkemuseum. I'd love to have one. With a pillow I'm sure it must be comfortable. This is a photo taken at Norsk Folkemuseum. It's a (mostly) outdoor museum with old houses. I've showed you a photo from this museum earlier as well. 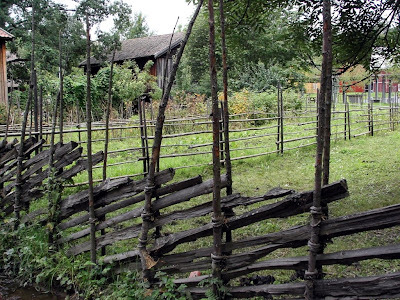 This is a fence built in a typical old Norwegian way. We call these "skigard" which is an old word for this kind of fence. 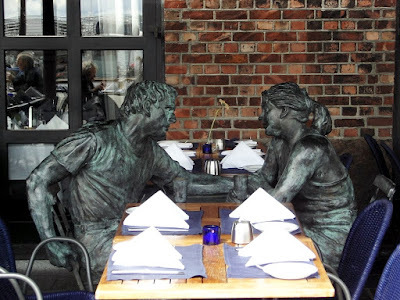 Another statue from an Aker Brygge restaurant. This young lady is ready to serve you something cold to drink. 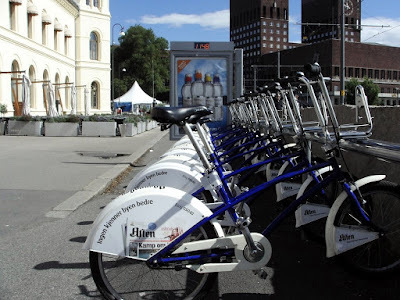 Oslo has a good offer to those who would like to get around in Oslo by bicycle: Oslo Citybike. There are approx. 1200 bikes to be found in different places of the center. To use them you have to register and pay a small annual fee. Then you use your "smart card" to release a bike from the rack. The bikes are financed by advertising and is therefore an environmental-friendly and inexpencive offer to the public. You must return the bike to the stand within 3 hours thus to make sure that there are bikes available to everyone who's interested. Another part of the park behind the royal castle. This shot is from a hike last summer. 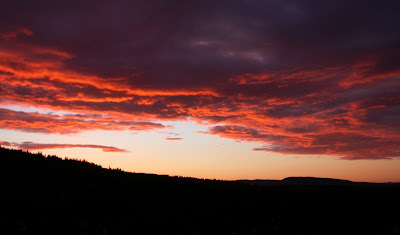 It's a view from the part of Oslomarka that is called Nordmarka (which would be "the field of north" in english). 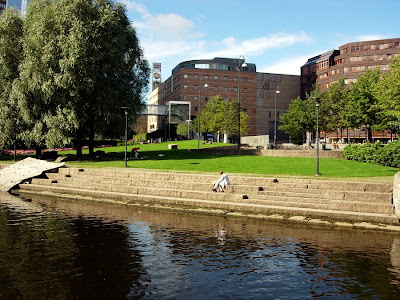 "Oslo is beautifully situated at the head of Oslo Fjord surrounded by forested ridges (Oslomarka), and this very location gives Oslo unexpected qualities for a national capital. Arable fields, vast forests and untouched nature areas surrounding the city are only twenty minutes from the centre. They provide recreational opportunities that are frequently taken advantage of by the city’s inhabitants, as well as increasingly by visitors, in summer and winter alike. Do you know of any other capital where you can go skiing and kayaking, make excursions to a nearby island or go skating – all within the city limits? 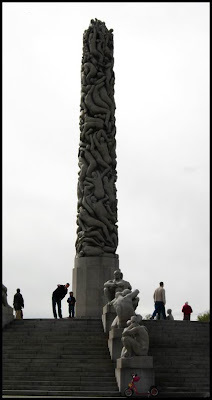 Oslo has a population of five hundred thousand, which is relatively low compared to most European capitals. However, it is paradoxically one of the largest in terms of area. 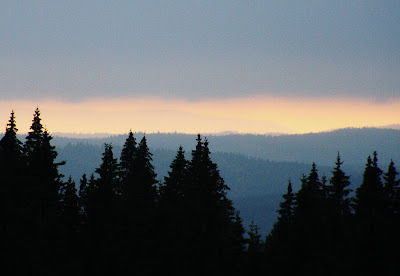 Oslo covers more than 450 square kilometres, most of which comprises forests and arable land." 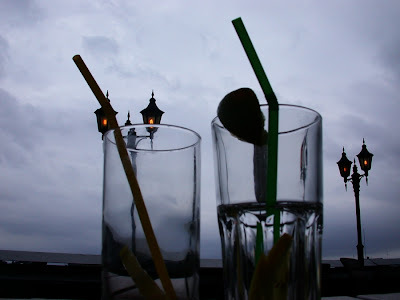 Two empty drinks on a table... memories of a nice evening at my favourite bar. 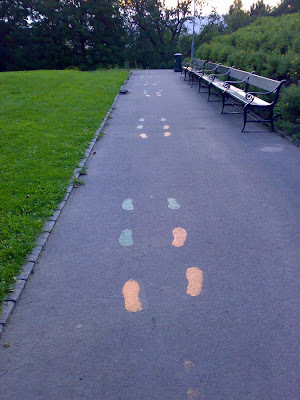 Here are a couple of more photos of these mysterious footsteps that can be seen in parts of Oslo. I got these from Britt M. who's working hard to figure out who is behind this. Is it a prank? Is it a commercial, or ...what? I'll be back with more info if we figure this out. Thanks to Miss Skavlan, I've been allowed to show you these mysterious and quite unique photos. This is a big mystery to many people. Who made these footprints and why? They were first seen at Bislett near a store that sells paint. 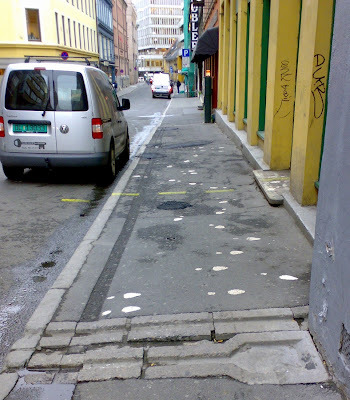 I thought they had done this to bring customers to their store, but then another person reported of similar footprints somewhere else in Oslo. My theory now is that there might be some art students who've made these for a project. Or perhaps a party that went wild? 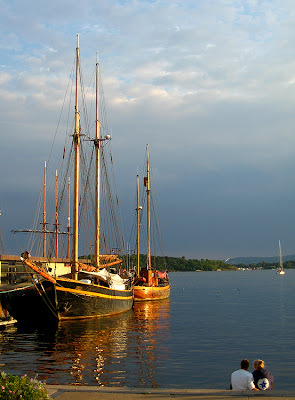 Outside Oslo there is a group of five small islands called Steilene. These five islands have a violent past if we should beleive the history behind the name. It's said that the name Steilene come from an instrument used in conjunction with torture and deathpenalties, that is called an Steile. The history says that the islands was used as a place where they killed criminals. Others belive Steilene was used to warn seafarers of the horrible punishment that was given to mutiny. You can see Oslo behind the island. To the left for the sailingyacht you can spot Holmenkollen too (the skijumping-arena Lothiane showed you earlier). 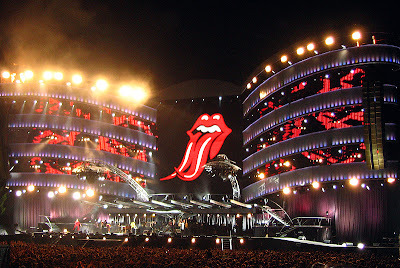 "By the time the Rolling Stones began calling themselves the World's Greatest Rock & Roll Band in the late '60s, they had already staked out an impressive claim on the title. As the self-consciously dangerous alternative to the bouncy Merseybeat of the Beatles in the British Invasion, the Stones had pioneered the gritty, hard-driving blues-based rock & roll that came to define hard rock…..read more"
We're getting closer to the election which is on September 10, and last night one of the political parties of Norway arranged a street party with several bands playing. I went there to finally get to see this band; Ila Auto. 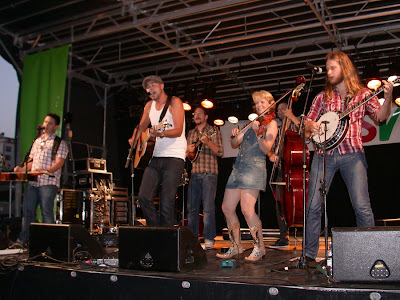 They're a great bluegrass band who have won a Norwegian Grammy Award. 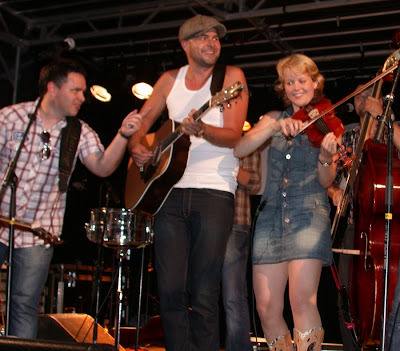 If you follow the link you'll get to hear a few of their tunes. Sunday Girl is one of my favourites. I'm really so impressed by this band, I hope they'll continue to succeed at what they're doing so well. 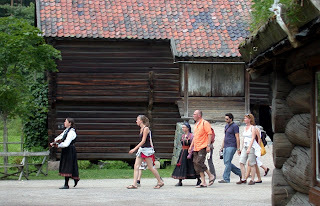 The last few days we've had a wonderful summer weather in Oslo, and thus we went to Norsk Folkemuseum yesterday. I've been meaning to go there all summer, but uptil now the rain had stopped that idea. This museum is a large outdoor area with old houses from all over Norway. You can also experience people making traditional food or playing traditional music. I soon discovered this woman with a strange instrument. 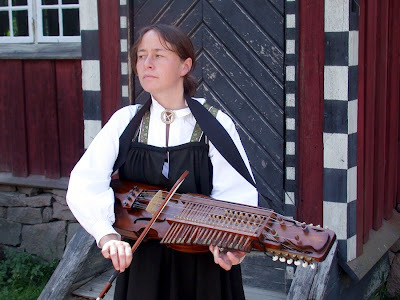 It is a "Nyckelharpa" (= key harp), an old instrument widely known and used in Sweden. I wish I could share the sound with you, it's so beautiful. If you're interested in reading about this instrument, please visit this really good page from the American Nyckelharpa Association. I found a lot of "nyckelharpa" on Youtube, you can listen there. I hope the woman doesn't mind me putting her photo up here, but this is the one that best show the nyckelharpa. I think it's such a beautiful, fascinating instrument with a pleasant, melancholic sound. This is probably the last photo from Bærums Verk. 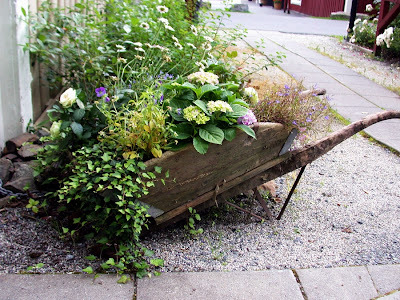 This old wheelbarrow has been allowed to spend the rest of its life supporting these flowers and plants. It makes a very nice decoration, I think. The building nearby is a shop selling delicious homemade jam and syrup (and much else). Very tempting! I found this piece of art at Bærums Verk (from yesterday's post). The kids love it, they all tried to climb it. What do you think? 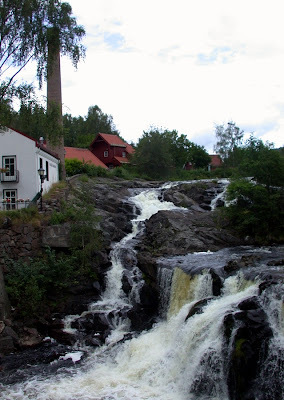 This is a photo from Bærums Verk, which is a very nice place right outside of Oslo. Approximately 400 years ago, King Christian IV of Denmark and Norway wanted his kingdom to be selfsufficient in iron production. His wish became reality when an iron ore was discovered at Kirkerud- and Eineåsen in Bærum. In 1610, Paul Smelter was given the King's commission to set up a melting house at Wøyen. In 1622 the first smelting furnace in the country was built here. In 1641 the ironworks was moved to where its remains are found today. During the ironwork's heyday, everything from cannon balls and cannons to bar iron, armoured plates and rivets were produced. Later items, such as ovens, grave ornamentations, kitchen utensils, hardware and machine parts gradually became the mainstays of production. Five lighthouses were also casted at Bærums Verk. 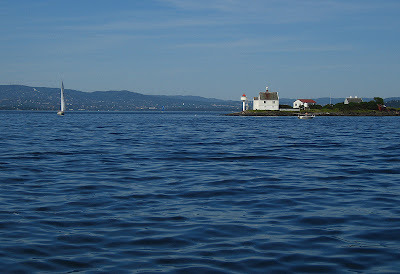 One well known lighthouse, - "Færder" (1855) is standing at the entrance of the Oslo Fjord. The Løkke Bridge in Sandvika was casted at the ironworks in 1829, and in 1895 it was immortalized by the French impressionist painter, Claude Monet. 1872 saw the end of the meltery and the beginning of a foundry and mechanical workshop that lasted until 1964. The area surrounding Bærums Verk saw an extensive housing boom in the 1980's which created the cornerstone for the development of Handelsstedet Bærums Verk. Several of the old buildings have been kept well, there are art and crafts shops, restaurants and exhibitions. When we visited we had a nice meal at the Pancake House. THE GALLERY KUNSTVÆRKET has permanent exhibitions of acknowledged Norwegian artists, along with guest artists. JOHAN FREDRIK ARNTZEN has his gallery and workshop in Verksgata 9B. His work in wood is inspired of boats and waves. EGENART Glassblowers with gallery and workshop. STABBURSKAPELLET (The Chapel). The tiny chapel was consecrated by the bishop of Oslo in 1993. It is popular for weddings and for smaller churchceremonies. This picture is a "short version" of the weather in Oslo this summer. 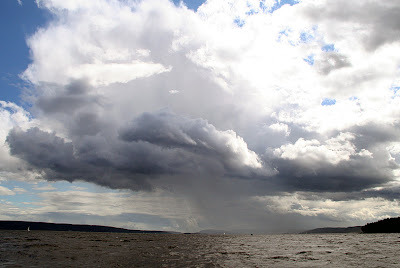 Just a little bit of the blue sky, lots of clouds and rain, very changing and very unpredictable! And yes, that rainfall you can see there was heavy! 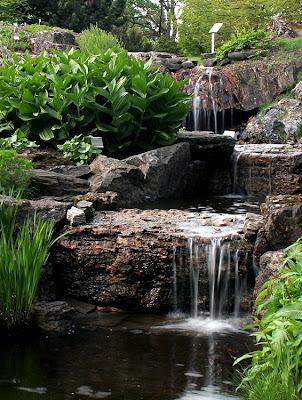 Another view from the Botanical Garden. 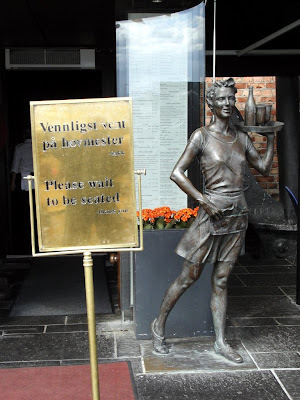 In 1995 Pascal Dupuy opened a small confectionery in Oslo, called Pascal. 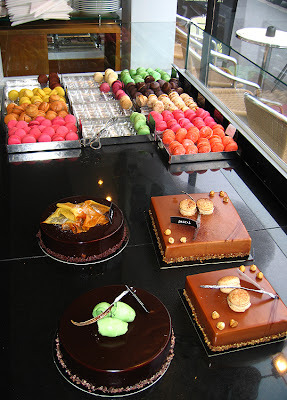 The French baker made the most delicious, French and sweet cakes.